the reasons a shooter doesn’t want to admit to. 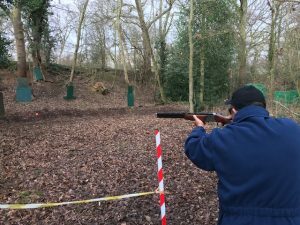 People were leading it or on occasion finding it bouncing when they shot under it which they did not expect, slow clays can often confuse people as they are expecting quick rabbits. From the tortoise to a quick quartering bird which looked like it was at the same height but you’d be wrong the bank behind the shot made it look like it was straight when in fact it was dipping down fast and once you had got ready for that a crossing bird on report did stay at the same height so got a few shooters shooting under it. A great layout by Mr Matthews again although yours truly was the only person to straight it. Whoop! Whoop! As always Deidre and Phil put on a lovely breakfast. All in all a great day shooting.